Rebel's Yell: What's Up with Mississippi? In the realms of chutzpah, it was a bona fide keeper. Mississippi Speaker of the House Philip Gunn said he was disappointed that a judge had ruled against House Bill 1523, which would have allowed discrimination against LGBT folks under the guise of religious liberty. Federal judge Carlton Reeves put a stay on the bill, which was to take effect on July 1, 2016. Gunn said, "We felt like it was a good bill, protecting religious beliefs and the rights of LGBT community." He did not explain how giving religious people a free pass to discriminate against the gay community would "protect the rights of LGBT community." He also did not explain his aversion to the use of a definite article. Perhaps he was trying to one-up his boss, Governor Phil Bryant, who received the Samuel Adams Religious Freedom Award from the Family Research Council (categorized as a hate group by the Southern Poverty Law Center), for signing the bill in the first place. During the award ceremony, held in Washington, D.C., Bryant said, "They don't know that Christians have been persecuted throughout the ages. They don't know that if it takes crucifixion, we will stand in line before abandoning our faith and our belief in our Lord and Savior Jesus Christ. So if we are going to stand, now is the time and this is the place." As Judge Reeves noted in his dissent, the bill was clearly a reaction to last year's marriage equality ruling that made gay marriage legal throughout the United States. Bryant and his friends in the Mississippi legislature thought they had come up with an end run around the ruling with a so-called "religious liberty" bill. After all, who doesn't want to protect "religious liberty"? Proponents argued that unless the bill was signed, pastors in the state of Mississippi would be forced to marry gay couples whether they wanted to or not. They provided no evidence for this claim, and were apparently unaware that not one pastor or priest or anyone else wearing a funny hat in this country has ever been forced to marry a gay couple against their will. He also said the "homosexual agenda is the greatest threat to religious liberty in our nation's history." 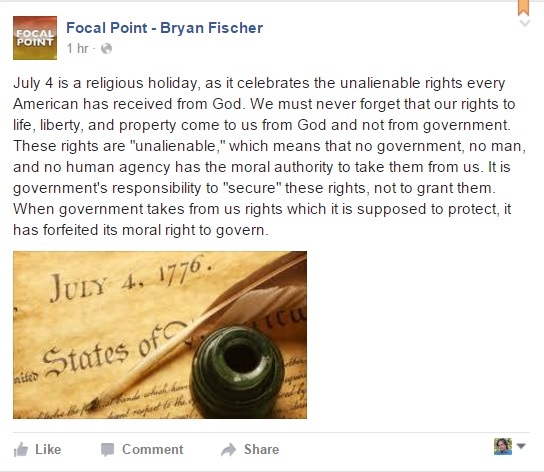 Fischer's overheated and over the top rhetoric is one of the reasons why the American Family Association was also categorized as a hate group by the Southern Poverty Law Center. The only sensible statement from a public official in Mississippi on this matter came from Attorney General Jim Hood, who said, "The fact is that the churchgoing public was duped into believing that HB1523 protected religious freedoms. Our state leaders attempted to mislead pastors into believing that if this bill were not passed, they would have to preside over gay wedding ceremonies. No court case has ever said a pastor did not have discretion to refuse to marry any couple for any reason. I hate to see politicians continue to prey on people who pray, go to church, follow the law and help their fellow man." The challenges faced by Mississippi are many and well known. How its opposition to gay marriage and gay rights in general will help the state with these challenges is a complete mystery. HB1523 has actually hurt the state. Many main street groups and chambers of commerce asked the governor not to sign the bill, as did major corporations like Nissan, Toyota, Levis, Tyson Foods and many others. The governor ignored all these folks and signed the bill anyway. Now that a stay has been issued against it, there is talk of an appeal. Why, Mississippi? What's up with that?